Without a doubt, the Help function in Word is the most useful at any given point. You can use it whenever you face a problem and you don't remember how a specific action is performed. 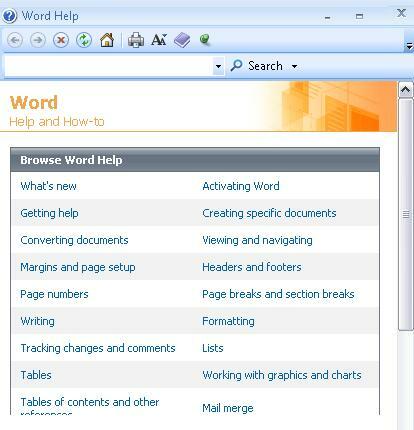 To access Word Help, you click on the icon found in the upper right-hand corner of your screen. The Help icon is represented by a question mark in a circle (see image below). This will open the Help menu. 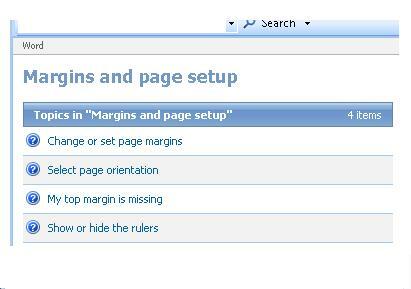 For example, if we wanted to know (or remember) how to setup margins and pages, we would click on that section (or press Enter). A submenu will appear showing the options regarding that function. This will help guide us towards what we need to know. 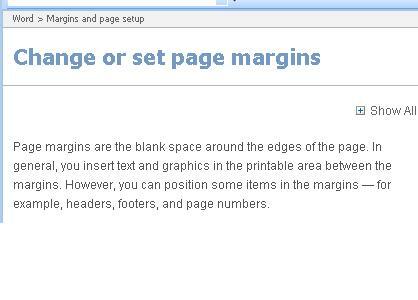 If we selected "Change or set page margins", a section with a brief explanation would open up to see if this is what we need. We would find an explanation of any concept related to its functions. Please, notice that the Word Help window has a toolbar which allows us to navigate through the functions command box (see image below). If we needed to print this previously selected Help, we would have to click on the Print icon and the information would be available to us.